Be environmentally friendly - use castor! It's horses for courses - as Bill says, with no oil filter using a detergent oil is unwise. As I've stated in previous posts - use the oil recommended by the engine maker. You wouldn't put gear oil in an automatic gearbox, or a straight 40 in a modern car requiring 5/10, so why think we know better? Old design engines run cooler with greater clearances than modern engines, so it stands to reason they require different oils. Even diesels require different oils, depending on whether they're normally aspirated or turbocharged. Most of the effects of detergent occur only in fevered minds. The oh so clever makers went spectacularly bust nearly 50 years ago. The oil they recommended wasn’t very good and is not available now, thank God. My iron-head 650 does not run cooler than anything, thank you very much! 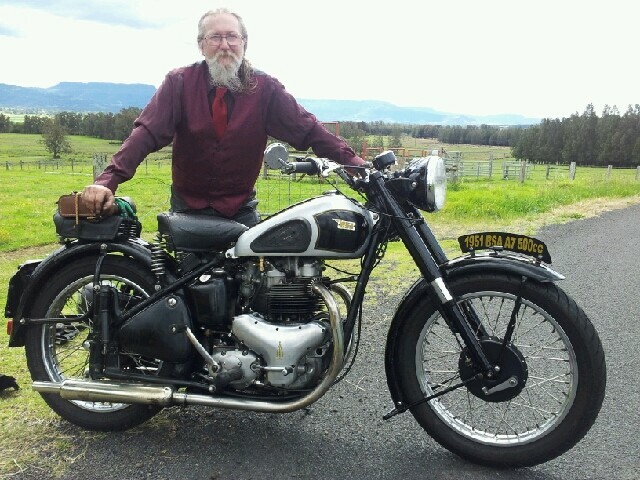 TT is correct, those old iron headed bikes run hot as hell. I watched two of them seize up within 100 yards of each other while attempting to climb a mountain grade last summer. I wondered then if some modern low friction, high film strength oil might have saved them. The A10 ( plunger Goldflash) was running some monograde mineral oil of some sort. Don't know what the other bike was using for Lube. Heat is the enemy of all air cooled engines and is especially there in the iron head/iron barrel machines. What usually stops them seizing is correct mixture and timing and keeping the revs up. And a generous bore clearance. And by the 70s the recommended oils were multigrades. Same engine and filtration. Funny about that. Back when a new Rocket was the thing to buy, the same oil went into A10s (sludge trap, no filter) as went into cars (filter, no sludge trap). My 1958-59 Constellation hand book states that if a modern multi grade oil with detergents was to be used when the bike had been using a monograde then only 50 miles should be covered with the new oil. The engine and oil tank should be drained. Re-fill with the multigrade and then a further 100 miles covered before draining again and rinsing out the oil tank and changing the filter. It warns of the possible danger of loosening sludge.etc.etc. The oil debate has been going for quite some time! The way I look at it. Particles/sludge/crap caused by the running of a motor falls to the sump and is pumped back to the tank. Some of this is fine enough to get through the strainer in the tank to be pumped into the crank where it is hopefully trapped. If a filter is placed on the return line (before the rocker feed pipe) there should be no "sludge" to be pumped into the crank. So in that respect it doesn't matter if you use mono or multi grade oil. I prefer multi as it's thin enough when cold to get working and thick enough when hot. 40/70 at the moment to fill the gaps (that shouldn't be there) and the 30-45C days. ps: I won't use synthetic anything! It’s commendable that Enfield gave the subject that much thought. And Enfields had a filter. If your bike has an effective centrifugal trap, it will always collect carbon black from the oil. Paper filters don’t trap that stuff. the sadly missed esso 20/50 was a lovely looking oil in a nice 5 ltr tin.not been around for 20 years. i m using castrol 10/40 synthetic and cartridge oil filter. recommended to use after 500 mile run in. But the 20w50 you bought back in the 70's is nothing like the 20w50 you get now days. Half of the compounds that go into modern 20w50 were not even invented / discovered back in the 70's and half of what was in there then is now banned, like all copper compounds. Next 20w50 is not a TYPE of oil, it is a VISCOSITY GRADE and that is all it is. I can get Agtrans in 20w50 Rotella in 20w50 and Valvoline in 20w50 and they are all totally different oils. You can get 20w50 without detergent additives or with normal levels of detergents or with higher levels of detergents. Putting a high detergent oil into a BSA prevents the oil tank sludging large particulates out of circulation. If an oil ank has the outlet at or very near the bottom then it is a resevior .